Climbing and flying in the peaks is the most thrilling combination that Babu Adventureoffers—a challenging climb to the summit and an exhilarating launch with the best views imaginable. 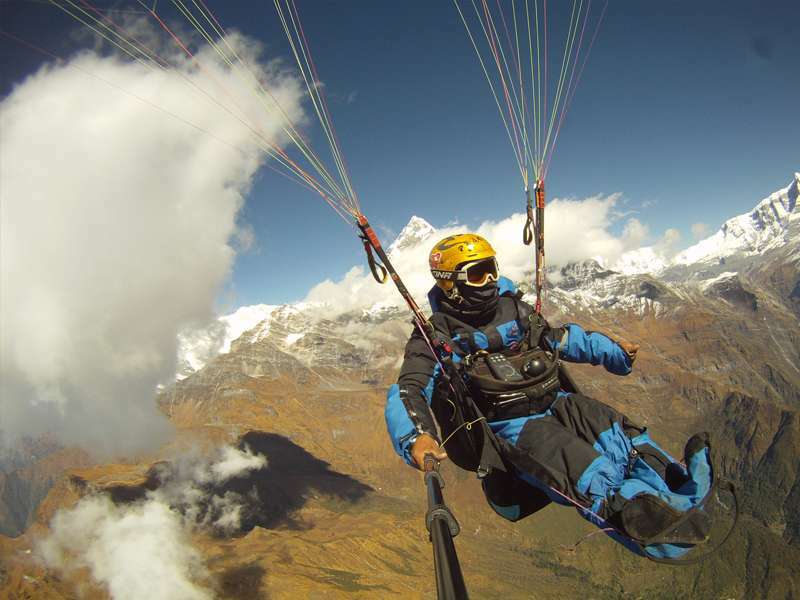 Flying like a bird in the lofty Himalayan peaks. We welcome all-comers for this special journey, whether you join for a tandem flight or are already an accomplished independent pilot. We consider ourselves pioneers in this field and have many levels of experience and training. Our personal accomplishments include the honor of being voted National Geographic Adventurers of the Year 2012 for climbing Everest and launching off the summit before then kayaking all the way to the Bay of Bengal. As you can see, we have experience and qualification both practical, hands on knowledge-based and theoretical training with a love for adventure. Our program gives advanced pilots the foundation and deeper knowledge for high elevation flying and chance to broaden skills. The instruction includes the most developed safety techniques. Before heading for the mountains, we have compulsory equipment overview and trainings. Babu Adventure takes care of all logistical support allowing you to simply enjoy the adventure! The journey to the summit of Mardi Himal (5553 m/18,218 ft) passescaptivating landscape with staggering views of unforgettable Machhapuchhre (Fishtail Peak) 6,993m (22,943ft) and a broad panorama of other peaks including Dhauglagiri (8167 m) seventh tallest peak on the planet, Annapurna I (8091 m) the tenth tallest, andManaslu (8156 m), eighth tallest. To the south, thePokharaValley sparkles below us on the journey upward. The trek to this peak passes through serene forests and is off the beaten path. The isolated areasees few trekkers which will give us a chance to get closer to nature. This is a camping excursion and we arrange all necessary staff with porters, cooks, tents and necessary gear. Our skilled cook prepares meals at our relaxing camp where we can savor the natural settings with unforgettable sunrises and sunsets and the heavenly stars above us. It takes six nights before we reach the summit, including a gradual ascent rate for acclimatization to altitude and a rest and exploration day. After summiting our launch point will be nearby from about 4,200 m. We then enjoy an unforgettable flight as we soar in the peaks with jaw-dropping views. We sail over the wondrous scenery as if we are birds. We pass over rural farmland of terraced fields and vibrant jungle as we make our way back to the spectacular lakeside destination and touch down near the shore line. Our crew will meet us there as we celebrate our momentous achievement. After reveling in the dream, you will be escorted by vehicle back to your hotel.